RWE is playing an increasingly important role in pharmaco-epidemiology, drug utilisation, effectiveness and post-authorisation safety studies. In Europe, these studies often require a multi-country perspective due to the rarity of the outcomes or product, or due to differences between populations, risk profiles, markets and healthcare systems. PHARMO is a trusted partner with a proven track record of European studies. Through our collaborations with other European databases we are able to effectively set up and coordinate your multi-country database study. By working with local partners, we can make use of the local expertise with the data and healthcare system to provide the right context and interpretation of the results. For more information on our partners, click here. When coordinating a multi-country study, our preferred way of work is as described in the figure below. The first step is the assessment of databases and if suitable, take care of contracting. The selection of databases will be made in consultation with our client. Once everybody is on board we will set up the study, which includes preparations for common data scripts. Please refer to our whitepaper “Real world evidence: a comparison between countries – common data models and SAS macro catalogs” to learn more on our approach for common data scripts. Following set up, local researchers will test and run the scripts, with the support of PHARMO. 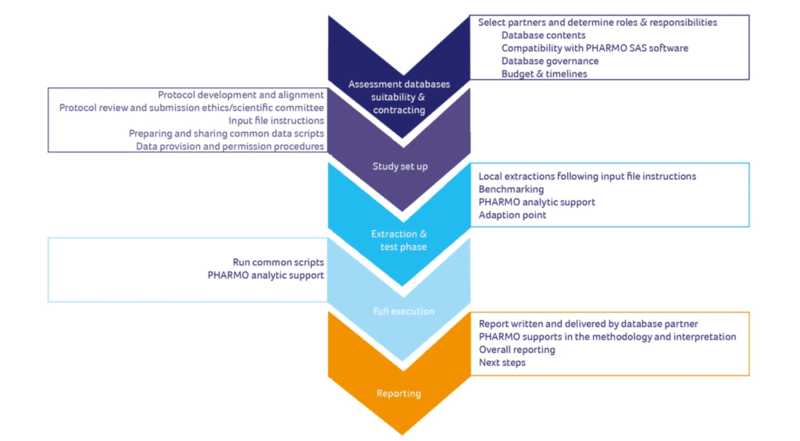 After the study has been fully executed, PHARMO and the database partners will start with reporting. The final layout of the deliverables will be based on the clients’ wishes. The process described is our usual way of work. However, as always, we are flexible in adjusting some steps to fit our clients’ needs and preferred way of work. For instance, we can act as a single point of contact for our clients, but if you prefer otherwise we are happy to adapt. Please click here for examples of past studies in Europe.